8.1 Crash during first startup with message "BUILT WITH UDK has stopped working"
MSAA DX9 and DX11. On or Off. 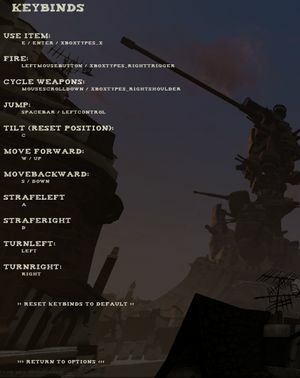 Options menu doesn't work with a controller. Use Helix Mod: Tower of Guns. There are some reports indicating that systems running on Windows 8 & integrated Intel GFX card cannot run the game. No fix is known as of yet. Crash during first startup with message "BUILT WITH UDK has stopped working"
This is caused by patching the game without starting up the original version. Reinstall game by running setup_tower_of_guns_2.0.0.6.exe. 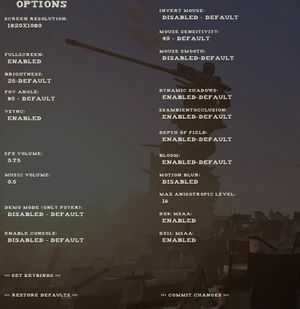 Patch game by running patch_tower_of_guns_2.0.1.7.exe or newer. 9, 11 Direct3D 11 can be forced with the -dx11 command line argument.